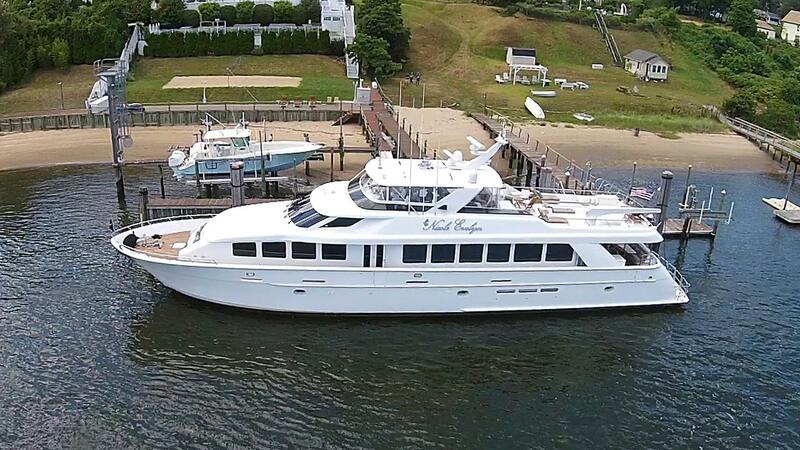 The 30.48m (100’) motor yacht VESPER (ex Nicole Evelyn) was built by Hatteras in the USA in 2002 and fully refitted in 2018. 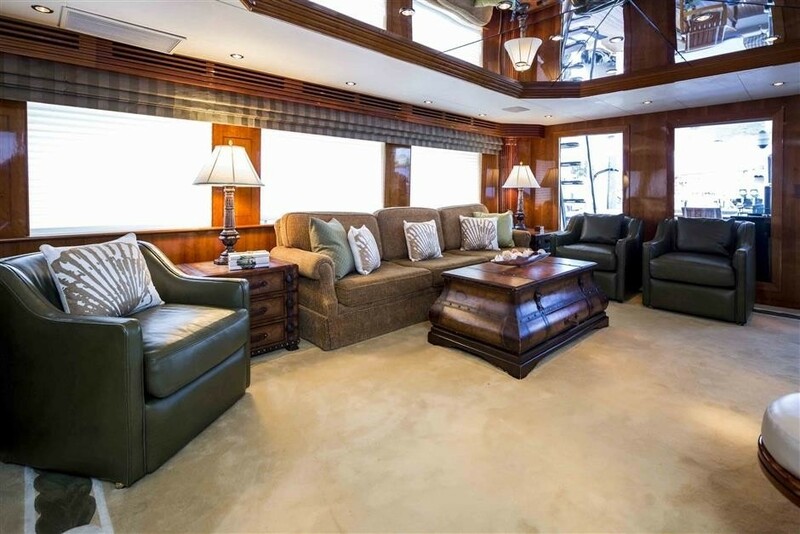 She is able to accommodate up to 8 guests in four cabins and has a crew of 4. 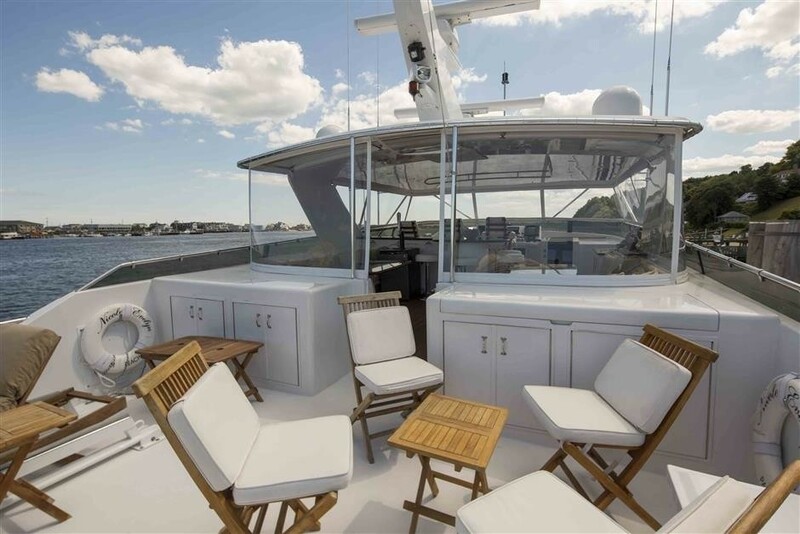 The swim platform provides easy access to the tenders and connects up to the main deck aft, where a sofa along the stern with a raised table creates a comfortable spot for alfresco dining. On the flybridge, the tenders are stored along the stern and are launched and retrieved using a Davit crane. 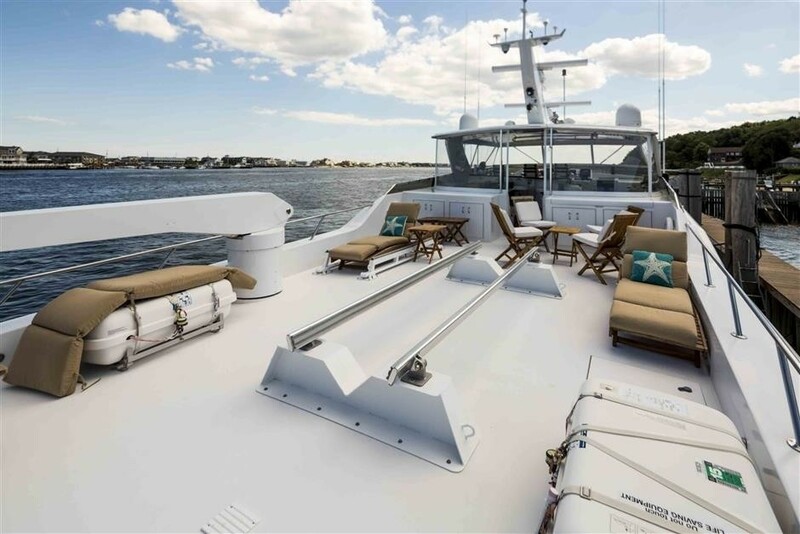 Sun loungers are placed on the port and starboard sides and there is a drinks table with four chairs for casual lounging together in the sunshine. 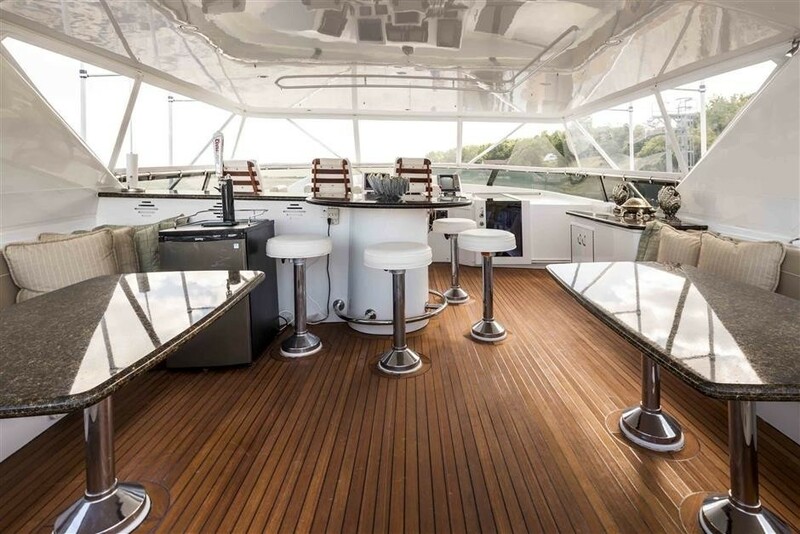 Two large tables and seating for alfresco dining are placed under the hardtop, where there is also a forward bar. 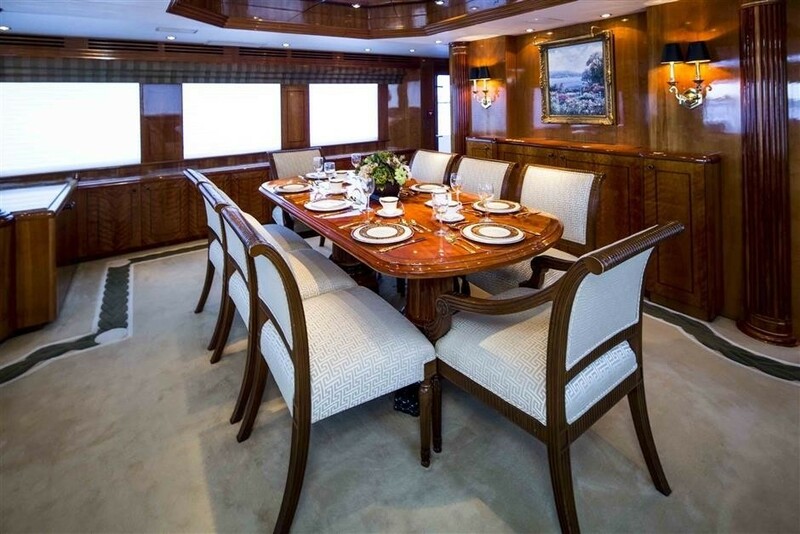 The beautiful open-plan interior uses an earthy colour scheme and deep wooden panelling that complements the bright white of the formal dining area furnishings, which are designed to seat up to eight guests in comfort. Massive windows span both sides of the interior for excellent views and an abundance of natural light. 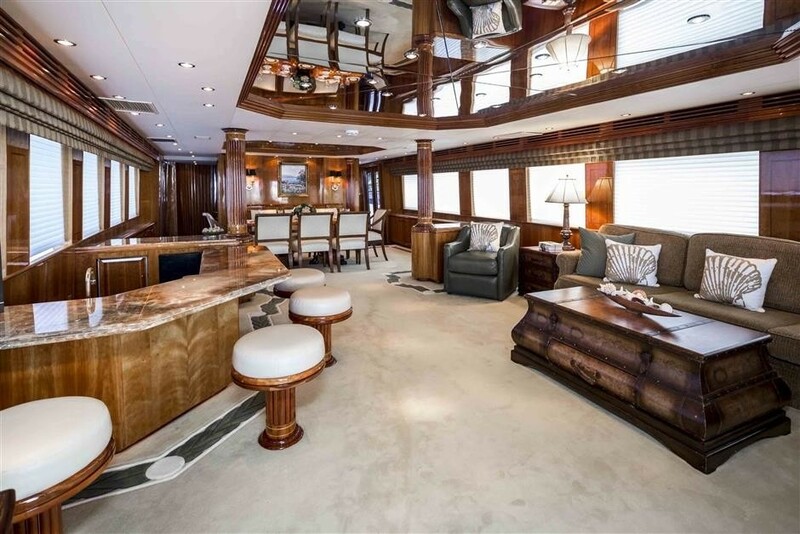 The aft section contains the lounge and the bar which is set up to provide laid-back sophistication and an efficient layout for families as well as special events. Three plush armchairs and a sumptuous sofa create a cosy corner lounge perfect for relaxation. Twin MTU engines each producing 1,800 HP produce a cruising speed of 18 knots and a top speed of 22 knots. 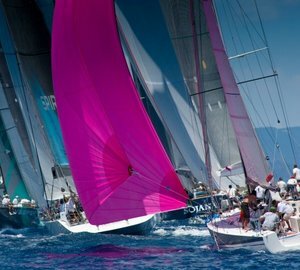 VESPER offers luxury accommodation for 8 charter guests spread over 4 guest staterooms, including an owner stateroom with an en suite His /Hers bath with walk-in wardrobe and full entertainment system. The VIP Queen cabin is located forward and also boasts an en-suite bathroom with large shower. Additional, two queen guest staterooms also have en-suite baths with showers. The queen bed, starboard converts into two twin beds.